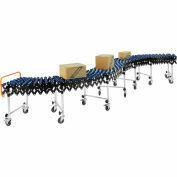 Flexible and expandable portable gravity conveyor is ideal for shipping, receiving, assembly and packaging stations. 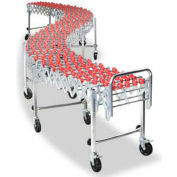 Reduces to 25% of expanded length for compact storage. 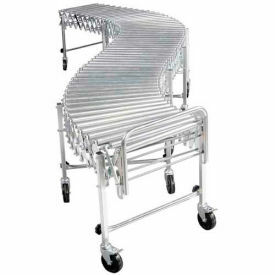 Roller Conveyor is ideal for material with flat or complex bottoms and have 1-3/8" dia. galvanized steel rollers, sealed bearings and spring loaded axles. 5-1/4" axle centers for 11" minimum package size. Zinc plated 12 gauge steel legs and 5/16" dia. steel axles. 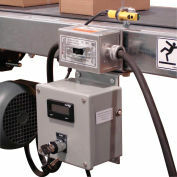 Box stop and 2 hook couplers included. Telescopic legs adjust from 28" to 44" high. 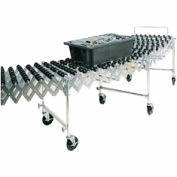 5" x 1-1/2" swivel casters, with brakes on end legs, for easy transport. All units bend around a 12" radius. 2 Year Limited Warranty. CAPACITY LBS200 lbs. 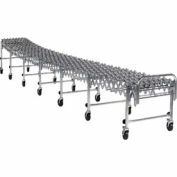 per ft.
NestaFlex® 22624024-S Flexible Conveyor Steel Skate Wheel 226 Lb./Ft. NestaFlex® 22618024-S Flexible Conveyor Steel Skate Wheel 226 Lb./Ft. NestaFlex® 22614008-P Flexible Conveyor Polymer Skate Wheels 226 Lb./Ft. NestaFlex® 22614008P Flexible Conveyor - Poly Skate Wheels Steel Ball Bearings 226 Lb. per ft.